Blood tests are not always helpful in predicting bacterial meningitis in children. X-linked hypophosphatemic rickets (PHEX mutation): A case report and literature review. Bartter syndrome associated with nephropathic cystinosis. The nature and prevalence of psychiatric disorders in a Sudanese juvenile correctional facility. 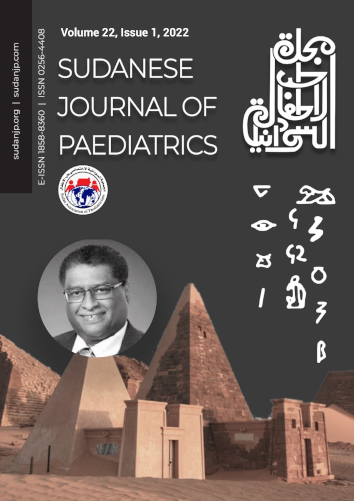 Four decades of the Sudanese Journal of Paediatrics and milstones. Severe desquamation in Kawasaki disease: Is it somehow protective? The articles in Sudanese Journal of Paediatrics are open access articles licensed under the terms of the Creative Commons Attribution Non-Commercial License (http://creativecommons.org/licenses/by-nc-sa/3.0/) which permits unrestricted, non-commercial use, distribution and reproduction in any medium, provided the work is properly cited. Copyright © 2019 Sudanese Journal of Paediatrics All Rights Reserved. Subject to change without notice from or liability to Sudanese Journal of Paediatrics.